As throngs of cosplayers, fans, enthusiasts, and families filed lined up outside the Vancouver Convention Centre this morning I had the privilege to interview Billy Boyd ahead of the second action-packed day of Fan Expo Vancouver. Billy is well-known for his character Peregrin “Pippin” Took in the Lord of the Rings series, making him a big draw at fan expos and conventions. “I’ve been to Canada quite a lot, I’ve worked in Canada quite a lot, but never been to Vancouver,” Billy Boyd told me before the doors to the exhibition opened up for the day. By next week he’ll be off to Calgary for another event and with his family in tow, he’s making this trip a Canadian adventure for them all. “The last time I was in Calgary I jumped off a mountain.” I asked if it was on purpose and Billy assured me it’s something he would never normally do, but it was for a TV show. “If there’s one way of getting you to do something you don’t want to do it’s to put a camera on it, because then you’re like ‘God it’s going to be there forever’. Like if I was just there with no cameras I wouldn’t have done it.” Billy was a guest for an episode of Jack Osbourne: Adrenaline Junkie (Series 5, Episode 5, 2009) where they really did climb and jump off a mountain in the Rockies, although he says the jump experience was just awful. Safely on the ground this weekend at Fan Expo, I asked what he gets asked about the most when fans sign up for meet and greets, Q&A sessions, and photo ops. At the top of his list was Hobbit feet — he gets asked about Hobbit feet the most. On top of portraying a memorable Hobbit, and his roles as Barret Bonden in Master and Commander: The Far Side of the World, and Glen in Seed of Chucky, Billy Boyd is also the lead singer of the Glasgow-based band Beecake. They’ve been awarded VisitScotland’s award for Best Live Act at the Tartan Clef Music Awards and released an EP, “Please Stay” in June of 2012. Billy says that they’ll most likely finish the album by the end of the summer and then they will hopefully go on tour by the end of the year. 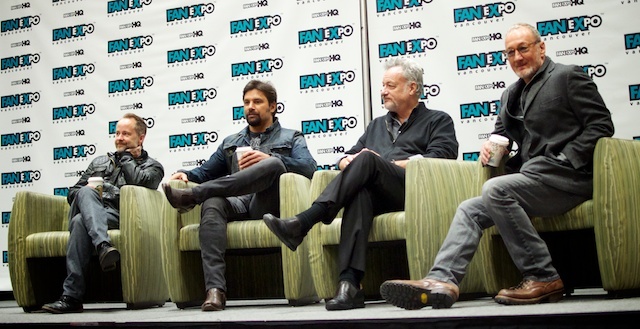 I asked if it was a different experience to tour as an actor — to events like Fan Expo — and to tour as a band. You can catch Billy Boyd at Fan Expo Vancouver today and tomorrow before he heads to Calgary Expo April 24-27. Fan Expo is open today until 7:00pm and Sunday, April 20th from 10:00am to 5:00pm at the Vancouver Convention Centre. You can still book your autographs and photo ops with Billy Boyd either online or on site. Check the Fan Expo Vancouver guest list online for the latest announcements and follow Fan Expo Vancouver on Facebook and Twitter for more information.